Renowned and recommended textbook in the subject that explains the basic concepts in concise manner. • Is an amalgamation of medical and basic sciences, and is comprehensively written, revised and updated to meet the curriculum requirements of Medical, Pharmacy, Dental, Veterinary, Biotechnology, Agricultural Sciences, Life Sciences students and others studying Biochemistry as one of the subjects. 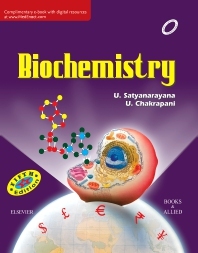 • Is the first textbook on Biochemistry in English with multi-color illustrations by an author from Asia. The use of multicolor format is for a clear understanding of the complicated structures and biochemical reactions. • Is written in a lucid style with the subject being presented as an engaging story growing from elementary information to the most recent advances, and with theoretical discussions being supplemented with illustrations, tables, biomedical concepts, clinical correlates and case studies for easy understanding of the subject. • Has each chapter beginning with a four-line verse followed by the text with clinical correlates, a summary, and self-assessment exercises. The lively illustrations and text with appropriate headings and sub-headings in bold typeface facilitate reading path clarity and quick recall. All this will the students to master the subject and face the examination with confidence. • Provides the most recent and essential information on Molecular Biology and Biotechnology, and current topics such as Diabetes, Cancer, Free Radicals and Antioxidants, Prostaglandins, etc. • Describes a wide variety of case studies (77) with biomedical correlations. The case studies are listed at the end of relevant chapters for immediate reference, quick review and better understanding of Biochemistry. • Contains the basics (Bioorganic and Biophysical Chemistry, Tools of Biochemistry, Immunology, and Genetics) for beginners to learn easily Biochemistry, origins of biochemical words, confusables in Biochemistry, principles of Practical Biochemistry, and Clinical Biochemistry Laboratory. • Complimentary access to full e-book and chapter-wise self-assessment exercises. Over 40 years (30 years as Professor) of teaching experience; authored four other popular books; published about 60 research papers in national and international journals; Gold medallist of Nagpur University; recipient of the Dr Krishnaswamy Best Teacher Award (of Siddhartha medical college); Fellow, National Academy of Clinical Biochemistry, USA, and the Institute of Chemists, India; Member of Research Board of Advisors for the American Biographical Institute; honoured as an Outstanding Scientist Worldwide-2007, by the International Biographical Centre, England.